PHOENIX SPORTS were founded in 1935 and have been known as St Johns Welling, Lakeside and Phoenix before settling on their current name. After playing in various leagues such as the Spartan & Kent County, they were inaugural members of the Kent Invicta League for the 2011/12 season. 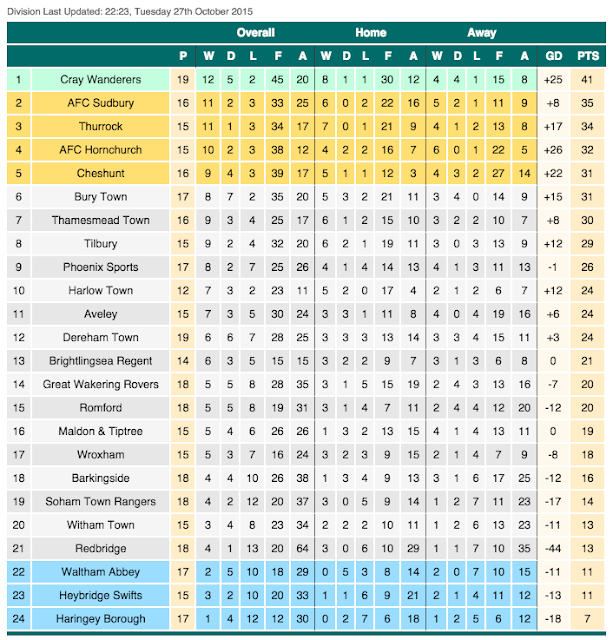 After finishing runners-up to Bly Spartans in their debut season, they were Champions the following season and so were promoted to the Southern Counties East League. 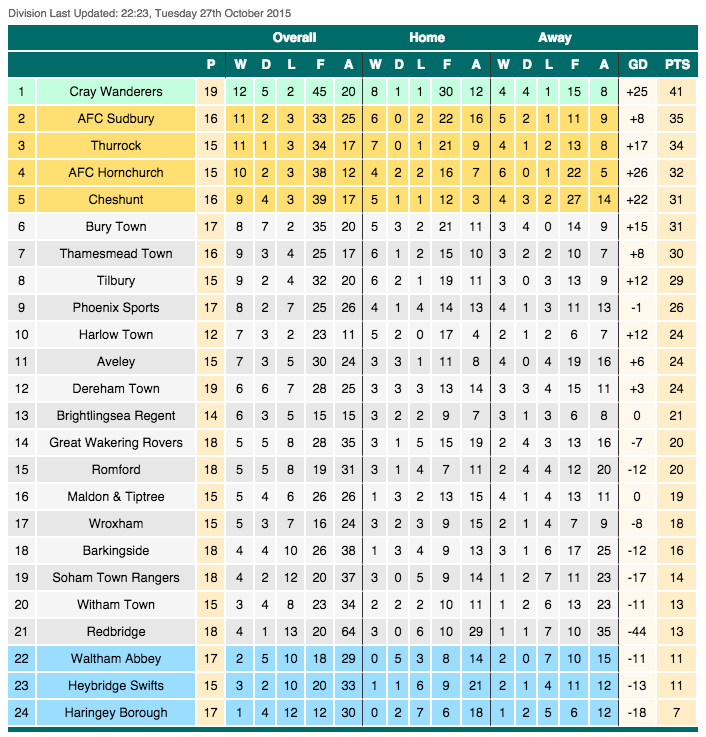 After a 6th placed finish in 2014, they won the league last season and therefore went up to the Isthmian D1 North for this season. They've made a great start too, sitting in 9th place at the start of the game. This season has seen record progress in the FA Cup with them beating Guernsey & Lewes before losing 5-3 to Hornchurch in the 2nd Qualifying Round. The FA Vase 5th Round was reached in 2015 before a defeat to South Shields. This was their debut season in the FA Trophy with them beating Whyteleafe 1-0 to set up today's tie. As far as local cups go, they won the KCL D1 Challenge Cup in 1994 and the West Kent Charity Shield on 3 occasions. For a long time now, I had wanted to meet my Tonbridge Angels supporting mates Joe & Tristan at one of their games. But the problem was, the games at the one or 2 grounds in the Isthmian Premier that I had not been to always fell on the dates of Wycombe home games. This was the case for this season, with the only available game at Needham Market falling on an FA Cup game so I couldn't commit. 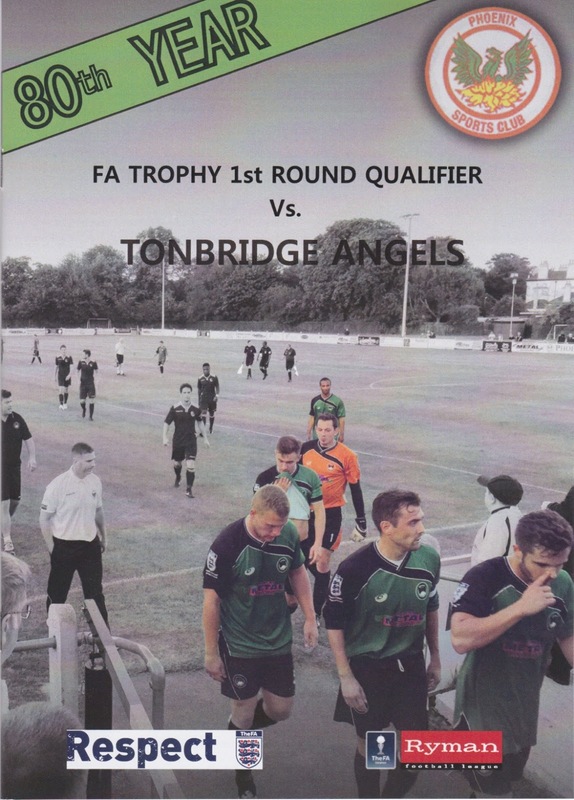 The FA Trophy however with the Angels being drawn away to either Whyteleafe or Phoenix Sports back in August. Phoenix Sports were the victors and so I pencilled the date in a month or so ago. It would mean missing a good away day at Mansfield with Wycombe, but all in all, it was worth it to meet up with friends, plus it would save me a bit of cash. I woke just before 9am on the day of the game. After having breakfast and getting ready I was on my way, picking Anwar and his son Hicham up at 11. It was a decent enough journey apart from near the Blackwall Tunnel, a route I had taken to avoid paying the Dartford Crossing charge. We got to the ground just before 1 and took the 20-minute walk into Crayford for lunch. 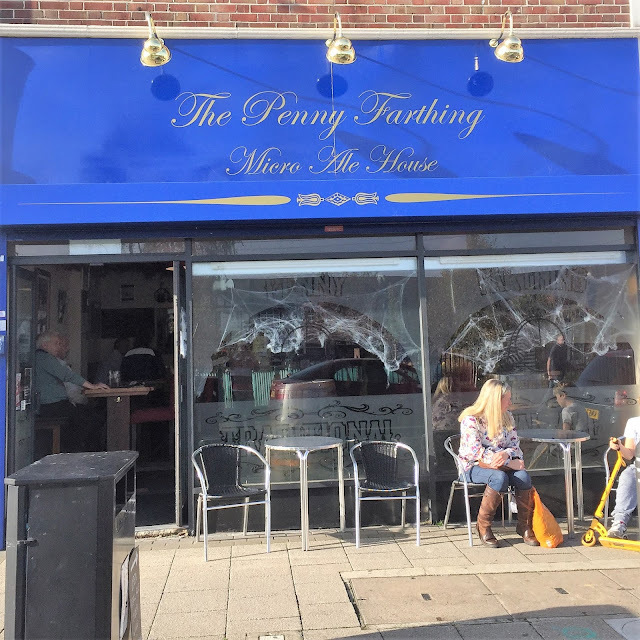 While Anwar and his lad looked around the shops, I went to a cracking little micropub called 'The Penny Farthing' and had a local pint of Duddas Tun Greenhorn cider which was very nice. It was surprisingly sunny given that it was nearly November and makes all those scare stories of the coldest winter in years look a load of nonsense. The pint was very pleasant and set me up for the afternoon. I do like the concept of Micro Pubs too, and wish someone would open one in Wycombe where the selection is woeful. 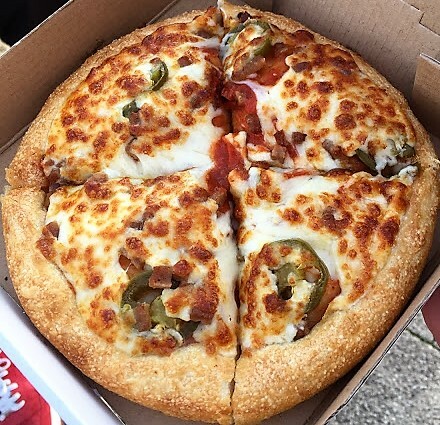 After that I made my way to a pizza place where I got myself a 7” pizza with jalapeños and spicy beef with a can of drink for the great price of £2.50. By then it was getting on for 2PM and so after popping to the cash machine we went up to the ground, getting there at 2.15. I picked up my bag from my car and went in, meeting Joe & Tristan in the bar. I didn’t bother having a drink but we did watch Chelsea capitulate to Liverpool, much to the delight of pretty much everyone in the bar. From there we went outside and after getting Anwar to take a picture of us we joined the Tonbridge faithful behind the goal and got chatting to a top fella called Martin who had given the lads a lift to the game. He was telling us about the journey up where he had pulled over and asked some random lass what she thought of Joe, with her reply being 'Ooh, he’s butters!’ Martin also had a bet with Joe that he could get the barmaid’s number and as he was successful Joe had to buy him a pint. All in all the Tonbridge fans were great fun and very welcoming, I also had a brief chat with Jamie, a Crystal Palace and Thamesmead Town who was at the game. Talking about the game, the report from the Non-League Paper is below. So Tonbridge had not done themselves justice, which was a shame and if anything Phoenix Sports should have won after missing a host of chances. I said goodbye to their fans and went and met Anwar & Hicham who had remained impartial and chosen to stand on the halfway line, getting a much better view of the action. We were soon on the way, and I tuned to BBC Radio Kent who are always very good for non-league coverage. Normally when there are no league teams playing the BBC would rather talk about cake baking or gardening but not with these lads who covered all their local teams. 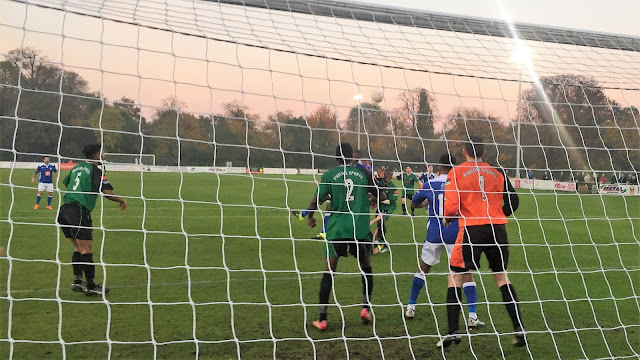 Though they might want to brush up on their geography as they had Dorset based Gillingham Town v Hengrove Athletic as one of their local results, obviously getting it confused with the Kent town. After dropping Anwar off at 6.30, I was home by 7 and spent the evening relaxing before watching Match Of The Day and going to sleep. 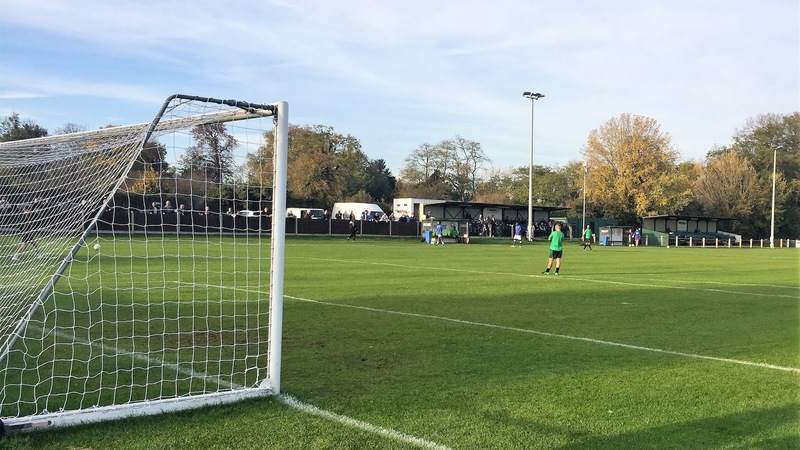 THE MAYPLACE GROUND is a venue that befits a side that has risen up the leagues in a quick fashion as it is a small assortment of metal 'Arena' stands, plus another small area of cover behind one goal. The bar is excellent though with a number of large screens that show the Sky football. I didn't try the tea bar, but from what I saw it looked pretty decent. Crayford town centre is a mile away and has a very good selection of food and drink places.